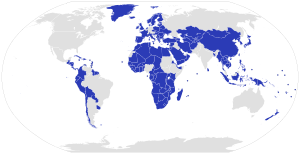 A cairt shawin the unitary states o the warld (in blue). A unitary state is a state govrened as ane single unit in which the central govrenment is supreme an ony admeenistrative diveesions (subnaitional units) exercise anly pouers that thair central govrenment chooses tae delegate. The great majority o states in the warld hae a unitary seestem o govrenment. This page wis last eeditit on 7 Apryle 2014, at 12:47.